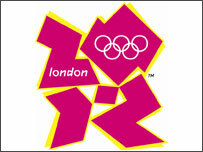 The 2012 London Olympics are Totally Awesome!!!! One of the more amusing stories of the last few weeks has been the debate over the newly unveiled official logo for the 2012 London Olympics. The jagged, garish image deemed by Olympic organizing committee chairman Sebastian Coe to be “the vision at the very heart of our brand,” has been loudly derided in most corners. Particularly upset, of course, are the Londoners who are going to be seeing this thing everywhere for the next five years. £400,000 and a year of labor went toward developing a logo that would help capture the imagination of youth in England and around the world. The result, according to some, is “hideous” and “messy,” while to others it resembles Lisa Simpson performing a lewd act. Either way, not most people’s idea of roughly $800,000 US well spent. To add injury to insult, a colorful animated segment from a video shown at the logo’s launch triggered seizures in epileptic BBC viewers around the country. A few years ago, an episode of Pokemon wreaked similar havoc across Japan. Is that the message the Olympic marketing campaign’s designers are going for: a Pokemon Olympics in 2012? Despite the overt youth targeting going on here, I believe the logo and accompanying campaign are supposed to be more iPod than anime. There has been a failure to engage a substantial young audience in the Olympics in recent years, so the 2012 organizing committee decided early to spend a great deal of time and money on youth branding. Drawing that distracted, multitasking Generation Y audience to something as pompous and neverending as the Olympics can’t be easy, but it means enormous amounts of money if done successfully. No one has done this kind of branding better than Apple in the last decade. So what does the Olympic branding team determine? To keep the attention of Gen Y-ers, you need bright, neon colors and flickering light. That appears to be their main takeaway from studying iPod commercials and MTV. And how do we associate this tone with the content of international sporting events? Why, by drawing neon colors and flickering lights on top of diving footage, obviously. Brilliant. I can honestly say as a member of the target audience that I am now thrilled by the idea of watching a fencing competition between Romania and Ecuador. And as for the logo itself, I assume some consultant pointed out that today’s youth won’t wear a shirt with your brand on it unless it’s “edgy.” Solution? A logo with lots of edges (and neon colors, since you can never have too many of those). Genius! The outcry over the logo has gotten a lot of people talking, so in that sense I guess it can be considered a successful marketing campaign so far. People are more aware of the brand now than if the designers had played it safe with something more classic and inoffensive. The problem is, most of the people doing the talking are the old folks who probably watch the Olympics anyway – the youth still doesn’t care. This logo is just another in an endless stream of attempts at loud, hip branding that are so omnipresent it’s impossible to make a Gen Y-er pay any attention. When 2012 finally rolls around, the actual content of the summer Olympics will be as bland and irrelevant as ever, and I’m not sure any amount of “edgy” branding can change that.